Can we bring in extra food/drinks besides the birthday cake? NO OUTSIDE FOOD OR DRINKS PERMITTED. Any additional food or drink must be purchased from our café. Guests are allowed to bring in a Birthday cake and party supplies to decorate table. Does 10 guests include the birthday child? What is the best way to book a birthday party? We have made it very easy to book everything you need for your party online. However, if you have additional questions or would like to customize your party just give us a call at 903-705-1230. Parties require 50% deposit at time of booking. Deposit is applied to party total. A party requires 7 days cancellation notice. Any party cancelled with less than 72 hours will forfeit their deposit. Can I arrive early for my party to decorate? We encourage you to arrive 15 minutes prior to your party start time to finish check in process and set up for your party. Can a waiver be printed for my party guests? Every iJump guest must fill out a liability waiver if they are jumping. A parent or legal guardian must create an account at ijumptexarkana.com to electronically sign a waiver on behalf of their children. 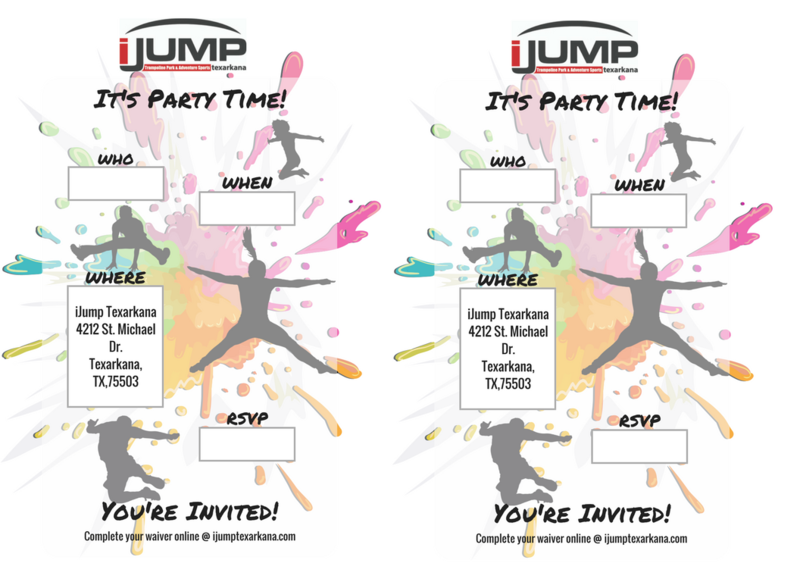 When inviting your party guests, please ask them to fill out a waiver online prior to the party. This will save tremendous time and congestion during the check-in process the day of your party. Please arrive 15 minutes prior to your party start time to be greeted by your party host. Your party host will help you set-up your party area and complete the check-in process.